Sadiq Khan, Experienced Drivers Don't Need English Tests! TfL wants all private-hire drivers to undergo reading, writing and listening tests from 1 October, which the High Court has accepted. It has already cost people money and their jobs. TfL is accused of ‘indirect racial discrimination’ when Uber challenged the new exams in the High Court. Transport bosses insist the ability to communicate in English is an essential qualification for any taxi or minicab driver. Everyone agrees on that, but half of us haven’t written essays or taken exams since high school. Some haven’t even been to high school. That never stopped them from getting by and being road safe, smart with the ability to navigate London roads, sometimes better than sat nav’s! What happens to people who don’t have a certificate to prove they have adequate skills, (perhaps failing their English test which doesn’t mean you can’t read or write). What if they started work as soon as they left school. What if they have learning difficulties but can communicate in English just fine? It seems that TfL doesn’t care, the only result will be that drivers whose only livelihood is driving will have to fork out the money to pay for these tests and if they fail, pay more money and pass, or lose your job. The test costs £180. If you fail you have to pay the same amount again until you pass. Clearly people are not happy. Companies are advertising courses to make money off of the misery of these drivers, offering “guaranteed success” if you join and follow their steps. Drivers are turning to them in desperation. Uber won the right to take Transport for London to court over it all. The tests are part of a wider package of “disproportionate and irrational” measures introduced by Transport for London that include round-the-clock call centers and requirements for drivers to be insured to carry passengers at all times, whether working or not, Uber’s lawyer Thomas de la Mare said at a hearing Tuesday. The company expects 23,000 drivers to fail the English tests each year. TFL data states the new measures will cut the number of private hire drivers in London by 45 percent to 61,000 by 2019, Uber said in its filing. The written aspects of the English tests would be more strenuous than comparable sections in the “knowledge” test taken by London’s traditional black taxi drivers, de la Mare said. Uber General Manager Tom Elvidge called on TfL to scrap the rules. “We’ve always supported spoken English skills, but passing a written English exam has nothing to do with communicating with passengers or getting them safely from A to B,” Elvidge said before the hearing. It’s not just Uber that will be affected. All private hire companies face this. A driver claims he failed the new minicab English test because he’s never been to Mars. 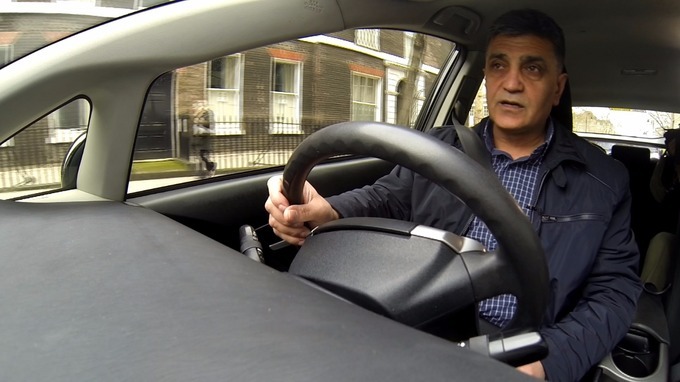 Hasan, Yasar, 52, has worked as van, truck and cab driver since moving to London from his native Turkey in 1993. But last month he was quizzed about the red planet during a £180 compulsory English test demanded by Transport for London. The test quizzed him about the red planet. Is this an English or Science test? My Martian knowledge is a little rusty. If these drivers were bad at their jobs, they’d get fired anyway. These measures are definitely extreme and harsh on ALL drivers from all walks of life.